This is the highest concentration of minoxidil we offer. It has 15% minoxidil (150mg/mL) and 5% Azelaic Acid (50mg/mL). This product is also enhanced with Retinol for increased absorption and penetration of active ingredients into the scalp. It is only recommended after all other Minoxidil strengths have failed to regrow hair. This product is free of propylene glycol. It is specifically formulated for those who are allergic to propylene glycol. If you are not allergic to propylene glycol, you can choose the other 15% minoxidil we offer. It dries slightly faster than this one. This product may be effective at one application per day. You can use it once daily at night by itself, or you can use it together with Minoxidil Laboratory 5% minoxidil solution, in which case you will use the 5% minoxidil in the morning and this product at night, as the lower concentration of minoxidil makes it easier to style the hair after the solution has dried. With this highly concentrated 15% minoxidil, you only need a small amount of solution to be effective, most times 0.5 mL is plenty to evenly distribute onto the treatment area. This product is not for women. Women should not use this product. 60 ML (2 Oz). It comes with a calibrated glass dropper for easy application. Sufficient for 2 months or longer with once daily use. Store the product at room temperature (50 F to 80 F or 10 to 27 Celsius) . Do not store it in a refrigerator, otherwise crystals may form and the effectiveness of the product will be compromised. The product has a shelf life of 2 years when stored at room temperature. All products are freshly made. Extremely flammable: keep product away from fire, flame, and do not smoke during and immediately following application. Two large scale clinical studies compared the efficacy of 5% minoxidil and 2% minoxidil, one for male hair loss and the other for female hair loss. In both studies (~400 subjects), people were either give 5% minoxidil, 2% minoxidil, or placebo twice daily. J Am Acad Dermatol. 2002 Sep;47(3):377-85. A randomized clinical trial of 5% topical minoxidil versus 2% topical minoxidil and placebo in the treatment of androgenetic alopecia in men. J Am Acad Dermatol. 2004 Apr;50(4):541-53. 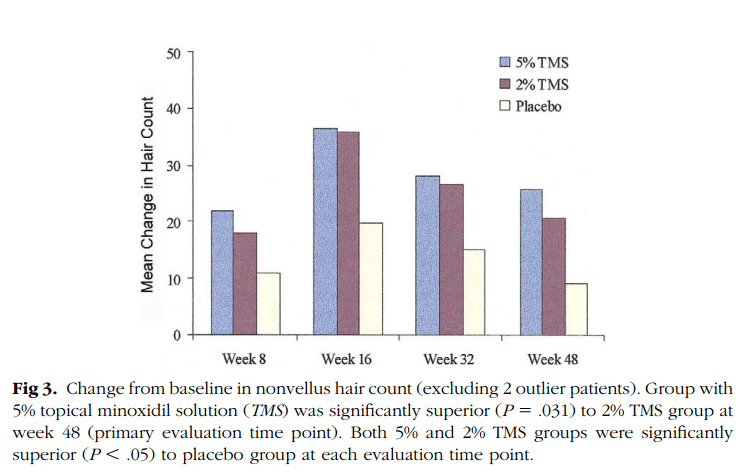 A randomized, placebo-controlled trial of 5% and 2% topical minoxidil solutions in the treatment of female pattern hair loss. Results after 48 weeks (~1 year) showed 5% minoxidil offered much better results than 2%, and 2% minoxidil offered better results than 0%. 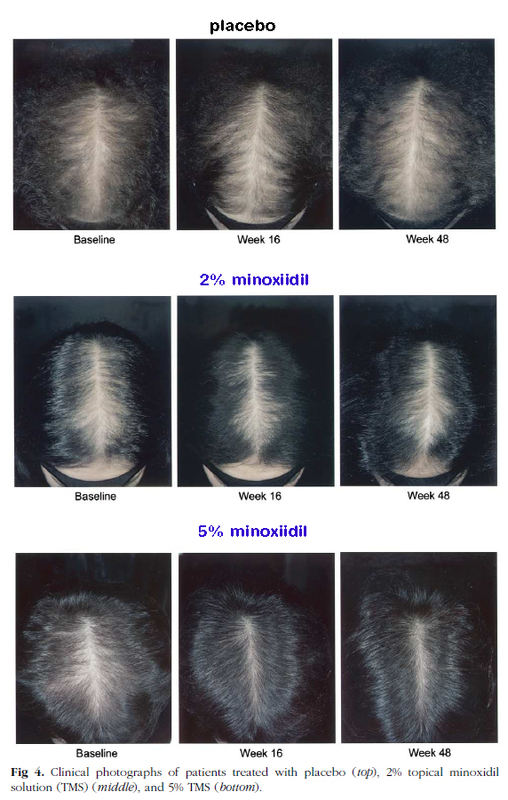 "In men with AGA (androgenic alopecia or male/female pattern baldness), 5% topical minoxidil was clearly superior to 2% topical minoxidil and placebo in increasing hair regrowth, and the magnitude of its effect was marked (45% more hair regrowth than 2% topical minoxidil at week 48). Men who used 5% topical minoxidil also had an earlier response to treatment than those who used 2% topical minoxidil. Psychosocial perceptions of hair loss in men with AGA were also improved. " Topical minoxidil (5% and 2%) was well tolerated by the men and women in the two clinical trials without evidence of systemic effects. These trials clearly show hair regrowth is dosage dependent. Better hair regrowth was achieved when using higher concentration of minoxidil. There is no official large scale clinical study on the 15% minoxidil. However, you can easily appreciate how the minoxidil concentration affects the hair regrowth from the before and after images below. The 5% minoxidil clearly gave much better results than 2%. Image is from this 2002 study, published on J Am Acad Dermatol. You can see more Before & After photos from MinoxidilMax site. Is it safe to use 15% minoxidil? The most common side effects of minoxidil product is skin irritation such as scalp itchiness and rashes, which is mostly caused by the delivery vehicle and some may be caused by minoxidil itself too. The skin irritation caused by delivery vehicle is usually due to propylene glycol, which can be avoided by using a propylene glycol free product like the one listed here. The skin irritation is reversible. It goes away if you stop using the product. Minoxidil is a cardiovascular substance. So does it cause any systemic side effects such as headache, palpitation, dizziness? Large clinical study involved with thousands of patients demonstrated that minoxidil has to have a serum concentration of 20 ng/mL to have any hemodynamic or other systemic effect in the human body. The clinical studies showed a 2% minoxidil solution resulted in 0.6 ng/ mL and a 5% minoxidil solution resulted in 1.2 ng / mL of minoxidil in the serum. So, there is more than a 16-fold safety margin from the use of 5% topical minoxidil, and more than 5-fold safety margin with the use of a 15% topical minoxidil solution assuming the serum concentration is tripled when the topical minoxidil is increased from 5% to 15%. In reality, the serum concentration should be less tripled. Thus the safety margin with the use f 15% topical minoxidil solution is more than 5-fold. You may see some sellers who market Natural hair loss treatment warn you the side effects of minoxidil products. Below is the table they use to try to talk people out of using minoxidil, the FDA approved and most widely used treatment. It is true that the table below shows the 5% minoxidil had higher chance of having side effects than 2%, and 2% had higher side effects than placebo. But if you look into the details of the side effects, you should see that the they should not be reason why you should not use minoxidil products or high strength minoxidil like 15% minoxidil. Here is why. 1. First of all, the study was done with women (not men). This is very important to know. It is well know that women should use lower strength of minoxidil than men. The main reason is that higher concentration of minoxidil may cause hair growth in unwanted areas in women such as sideburns, forehead, cheeks, chin (hypertrichosis). The study showed that 4 people (3%) in the 5% minoxidil group had hypertrichosis, while the 2% and placebo group had none. Besides the hypertrichosis issue, the other common nonserious side effect is pruritus (scalp itchiness). It was seen in 5% people in the 5% minoxidil group, 0.6% in the 2% minoxidil group and 3% in the placebo group. The more concerning side effects of minoxidil products are headache, palpitation. The data showed that these side effects are essentially the same among all three groups. It was observed in 3% in the 5% minoxidil group, 5% in the 2% minoxidil group and 3% in the placebo group. What it means is that the study often quoted by sellers who promote natural hair loss products didn't really show that higher concentration of minoxidil causes higher chance of dangerous side effects such as headaches, a drop in blood pressure, and heart palpitations. While the other side effects such as pruritus can be largely avoided by using our specially formulated minoxidil (propylene glycol free minoxidil). In the conclusion section of the same study, the author wrote "Both concentrations (5% and 2%) of topical minoxidil were well tolerated by the women in this trial without evidence of systemic adverse effects. An increased occurrence of pruritus, local irritation, and hypertrichosis was observed with 5% topical minoxidil versus 2% topical minoxidil and placebo. ". The author further pointed out that"With the introduction of numerous herbal remedies for hair loss, of which most have not been tested in randomized, double-blind, placebo-controlled trials, it is important to describe well controlled trials that demonstrate the efficacy and safety of topical drugs.". It is clear that the author noted that are many herbal (natural) hair loss product that makes unrealistic claims without any proper study to support the efficacy and safety of their products. 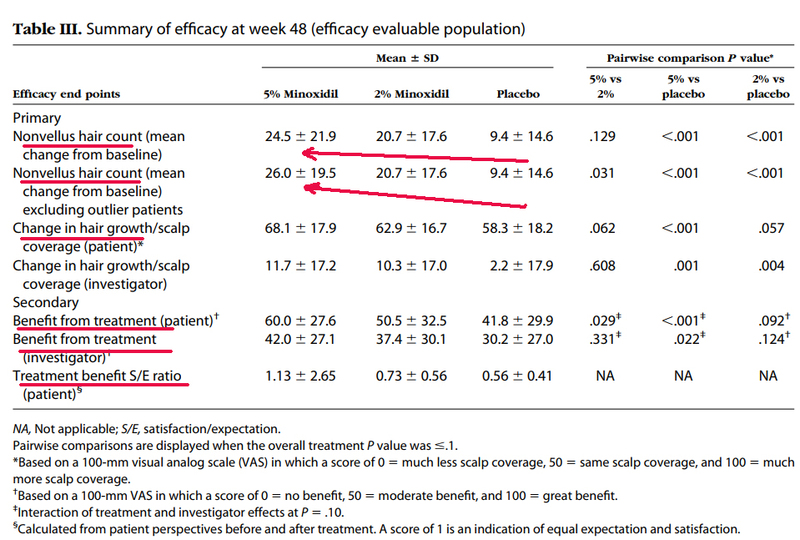 If 15% minoxidil works better than 5%, why isn't there any big pharm company that offers it? MinoxidilMax offers the following insights. A: There are three reasons why big pharm company is not offering it. Very few companies in the world know how to compound 15% minoxidil. Believe it or not, most 15% minoxidil products available online are fake. They are either repackaged 5% minoxidil solutions or even no minoxidil at all. You can easily find out if a 15% minoxidil is real or not by having it tested by a reputable analytical lab. Arl Bio Pharma (http://arlok.com/) can test it for 150 US dollars. Companies need to go through an FDA approval process to allow them to market the solution. The approval process can easily cost hundreds of million dollars, and it can take many years to complete the clinical trials. They don't have a patent for the use of higher than 5% minoxidil solutions to treat male pattern baldness, which means any company can make and sell it. For something to be patentable, one of the requirements is that it has to be something new that has never been disclosed to the public before. So even if a big pharmaceutical company decides to invest in 15% minoxidil and successfully gets FDA approval, it won't be able to patent it since this formula has long been used. Yes, if they can make a 15% minoxidil foam, they could patent the 15% minoxidil foam because no one has ever made such a product to our best knowledge. Without a patent, a big company won’t invest in it to get FDA approval because its profits cannot be guaranteed. Keep in mind that when big companies make decisions on investment, the first thing they consider is how much profit it can make, not how good a product is. If selling sugar water or junk food can bring them big profit, they will not hesitate to do so. I have used Dr. lee's 15% minoxidil for many years and received very good results. Since Dr. Lee stopped his business and I tried Rogaine for a few months. I lost tons of hair. I tried this product out of desperation as I had no other options. The results surprised me. I think this product is at least as good as Dr. Lee's . I have been using it for almost five years. Can't live without it. used it for 5 months. I like the results but it is very expensive. I have tried several different brands of 15% minoxidil. Minoxidil lab's worked the best for me.